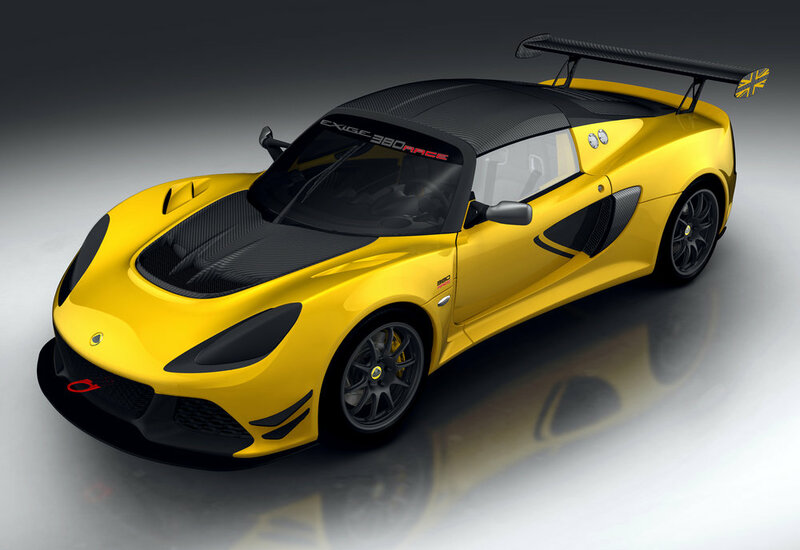 A track-only Exige Race 380 has been unveiled by Lotus, described as unapologetic, uncompromising and built to win. The sibling of the Exige Sport 380, the race car can enter competitions for teams as well as privateers in the 2017 / 2018 season. With a host of ‘competition-focused’ components as standard - the gearbox, suspension, aerodynamics and electrical systems are among the items that have been modified to reflect the car’s new role. Developed to be eligible for the world-wide Lotus Cup series and a number of clubman championships, the race car retains its sibling's 3.5-litre supercharged V6 engine with 375 hp at 6,700 rpm and 410 Nm (302 lbft) of torque at 5,000 rpm. However, in order to 'extract every ounce' of performance, the Race 380 model comes with an Xtrac 6-speed sequential transmission, oil cooler, and cassette-type plate limited slip differential, and is operated by carbon paddles located behind the steering wheel. The Exige Race 380 sprints from 0-60 mph in 3.2 secs, and laps the company’s Hethel track in 1 minute 23.5 seconds - the fastest ever for an Exige. Generating even more downforce from the car’s aerodynamics, the Race 380 produces 240 kg at 170 mph, thanks to some ‘careful revisions’ says Lotus. Vents are incorporated into the front bodywork and rear bumper to reduce pressure around the wheels and increase downforce; and a grille mounted at the rear aids air circulation through the engine bay. A new front splitter reduces pressure beneath the Exige, whilst the rear diffuser and larger and a straight-cut motorsport rear wing mounted to the bodywork helps modify airflow at the rear of the car. Stopping power comes from AP Racing forged, four-piston callipers and grooved two-piece brake discs. A revised suspension configuration, incorporating 2-way adjustable Öhlins dampers and adjustable front and rear anti-roll bars has been added too. This, together with the Lotus Traction Control System - where the amount of wheel slip can be adjusted by the driver from the cockpit - allows owners to fine tune the vehicle’s handling characteristics. With a full, integrated roll cage, lightweight FIA Carbon driver seat (HANS compatible) and a six-point harness, ultra-lightweight polycarbonate side windows, a competition specification fire extinguisher, battery isolator and front and rear motorsport towing eyes are also fitted on the Exige Race 380 model. An ultra-lightweight carbon fibre motorsport specific louvered tailgate panel is fitted over the engine and carbon fibre air intake pods are fitted to either side of the car forward of the rear wheels. As with other race cars in the Lotus range, headlamps are replaced by matt black covers and airbags are not included in the specification. Helping the driver stay on pace, a colour TFT instrument cluster offers numerous user customisable and programmable screen configurations. Incorporating a track data logger and GPS unit, owners have the opportunity to upgrade this logger with professional data analysis software. The Exige Race 380 is available to order now, priced £99,500 excluding VAT.